It doesn't take a genius to figure out that I am a huge fan of Alejandro Jodorowsky, yet I only became a fan last year when my friend Nevs Coleman recommended I read a few titles. It was an instant hit with me as I love tragedy, comedy, drama, and stories about awful, awful people. Make no mistake that there are rarely any GOOD characters in the most popular of Jodorowsky's stories. Although you may be able to say that this is because there are so few good people in real life, I feel that Jodorowsky simply amplifies selfishness (and all other human emotion) to create the ultimate drama. Maybe he's a little pessimistic, I do like to think that people are MOSTLY good... maybe. All that aside, Metabarons is really no different and full of the crazy drama I've come to expect from Jodorowsky. It's no surprise that this story is particularly brutal. The history of the warrior Metabarons dynasty is relayed through a conversation between two robots. The senior robot Tonto being a servant of the Metabarons passed down through several generations, explains the mystery of the clan to a younger robot, which he berates for his inferior brain power. It feels almost like Mystery Science Theater 3000 with their banter and commentary as illustrator Gimenez gives us the full picture of what history took place. 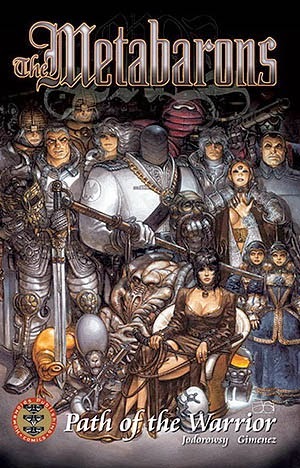 We see the brutal end of the Castaka's clan where the Metabarons originate. From then on we learn how the prestigious title of Metabaron is passed from Father to Son through each succession. In order for one to claim the title, the father must be killed in battle. Their history is fraught with controversy and compounded with tragedy so no one successor is ever a happy individual. The trials that await each are terrifying as each son is mutilated by their family. The interesting thing about this story is Jodorowsky's play with gender. He blurs lines and utilizes the infinite possibilities of science fiction to create androgynous and mixed gendered characters. We are in an age where gender is finally being recognized beyond the binary. It's always exciting to see such things incorporated into fiction. I love how Jodorwosky's science fiction takes advantage of the fun one can have with gender within a story. Osamu Tezuka also does this in many of his stories. He plays with gender, androgyny and battles against traditional gender roles. Although I don't wish to make a direct comparison, I do think of one while reading the other for many reasons. One of those reasons listed above. Maybe I'll save that discussion with myself for another day. Anyway, if you want an epic, brutal space opera with some hilarity throwing there between shocking events then pick up this book. I promise that you will fall in love with Juan Giménez's artwork! It too is shocking.